If you compare this week’s M Countdown chart from last week’s you’ll notice a massive difference. A lot of new names this week. Barely ten songs from last week’s chart appear this week. I wonder how Mnet selects their winner. Anyway, SHINee won last Thursday’s M Countdown episode. With this sweep, they swept all three award giving body music charts. SHINee seems to be on their way up as a top contender in the music scene. But honestly, I still don’t like the song. It’s weird though. I really loved their first three song, choreography and song, but the latest songs from them is not really my cup of tea. I enjoyed the dance in “Juliette” but I really hate the song. I know hate is a strong word but that’s why I’m using it. And with this new song of them, “Ring Ding Dong”, everything is off for me. The singing and dancing. It’s like their not the SHINee I have come to love anymore. I really dislike their new song. Since SM artists are still ban in Mnet, here’s the performance of Ring Ding Dong in another music show. Park Hyo Shin won last Thursday’s M Countdown. From what I’ve gathered, this is his second but I don’t know if he won last week or if there was none last week. Apparently, M Countdown was cancelled a week ago and I think it’s the same reason as Music Bank. But unlike MB, Mnet did not post the ranking from last week. Accdg to their site, the chart below is from the 23rd to the 39th of October. Anyway, congrats still to Park Hyo Shin. Here’s his performance in the said episode. When T-ara, 4minute and f(x) debuted, they were already visible in some online charts. Maybe it’s not the same thing on guys. MBLAQ and B2ST/BEAST debuted this weekend but none of them made it in the list. Well, maybe next week. Also, I take back what I said in T-ara and Supernova’s song. I forced myself to listen to it and at first I didn’t like it but I suddenly heard myself humming it. I like the 2nd one better. It has a very powerful pre-chorus. SHINee seems to be doing well in the album charts. I’m actually surprise that they are. I remember reading that Cassiopeia were boycotting all SM merchandise. So Cassiopeia isn’t really that many in Korea? 05 Yoo Seung Chan – How Are You? Kim Tae Woo must be really happy right now. This is his third win in the said show. It’s actually nice to see a non-idol win. Just to put variety in the atmosphere. Well, Kim Tae Woo used to be one but he’s not anymore. There’s just too much idol lately. But I honestly hope that those idols will be successful. It’s kinda tiring to have the same group winning over and over. Ballads seems to be in around Korea. Top three spots are again belong to three balladeers. 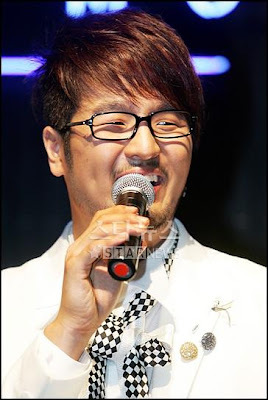 Kim Tae Woo seems to be on a roll. Music Bank and now M Countdown. 2 down, 1 to go. Let’s see if he can win one in Inkigayo.